January Quotes i.e. searching for some funny and cute quotes about month of January. If yes, now you don't need to search for them anymore. As here I have compiled down some of the best and happy January quotes for you. Just hope you will like the quote compilation and welcome this month of January by sharing some of quotes from here. Hello January! Please be nice. One of the special joys of January is telling others we care and remember Love. January is the quietest month in the garden. ... But just because it looks quiet doesn't mean that nothing is happening. The soil, open to the sky, absorbs the pure rainfall while microorganisms convert tilled-under fodder into usable nutrients for the next crop of plants. The feasting earthworms tunnel along, aerating the soil and preparing it to welcome the seeds and bare roots to come. Keep Calm and Say Hello to January. Let's spark up January and make it better than December. 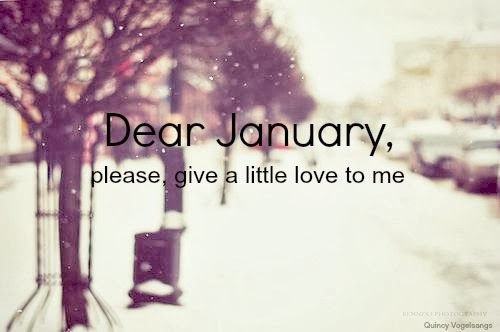 Dear January, Please give little love to me. January, Make my wishes come true. Hello January! Please be good to me.